*Cattle Markets were closed last week due to the holidays. As most are already aware, the citizens of the United Kingdom voted on June 23, 2016 to end its membership in the European Union. The immediate effect of the vote caused markets across the globe to come tumbling down. The Dow Jones industrial average dropped just under 3.4 percent following the vote, while some individual European stocks dropped by as much as 20 percent. Meanwhile the value of the dollar jumped to the highest levels since March as investors sought more stability. In the days following the United Kingdom’s decision to leave the EU, many of the markets have begun to return to pre “Brexit” levels. The Dow Jones industrial average has fully recovered its lost value, while the U.S. dollar index has slowly began to creep lower again. In terms of trade, the vote to leave the EU means that the United Kingdom will also be leaving behind many of the trade agreements with the EU. That includes agreements made between the EU and the U.S. On the positive side, that leaves the U.K. with more freedom to negotiate its own trade agreements with the U.S. and may be able to avoid the restrictive policies toward U.S. beef in any new trade agreements. In recent years, U.S. beef trade with the United Kingdom has been limited but growing. The U.S. exported 3.668 million pounds of beef to the U.K. in 2015, up from 913,000 pounds in 2014 and 502,000 pounds in 2013. While U.K. imports currently pale in comparison to countries such as Canada, Mexico, and Japan, with the ability to directly negotiate with the U.S. without interference from its other European counterparts we could eventually see a boost in U.S. beef exports headed to the U.K. So what does this all mean for beef markets? In the very short run, the "Brexit" vote caused a drop in cattle markets as traders feared that falling stock markets could put a damper on beef demand. But, as I mentioned earlier, the Dow Jones Industrial average has fully recovered and the effect on cattle markets didn't last long at all. In the days following the vote, other factors took hold in the cattle markets and traders have essentially forgotten the vote. Ultimately, in the long run the U.K.'s vote to leave the EU will not change the cattle market fundamentals. Factors such as feed prices, herd size and growth, and domestic consumer demand, among other things will continue to be the drivers behind cattle markets. U.S. red meat exports gained momentum in May with shipments of beef increasing significantly year-over-year and reaching 2016 highs, according to statistics released by USDA and compiled by the U.S. Meat Export Federation (USMEF), contractor to the beef checkoff. May beef export volume increased 12 percent from a year ago to 219.3 million pounds. Export value ($533.3 million) was 4 percent lower than a year ago but still the highest since July 2015. For January through May, export volume moved 3 percent ahead of last year’s pace at 975.8 million pounds, while value was down 11 percent to $2.37 billion. Exports accounted for 14 percent of total beef production in May and 11 percent for muscle cuts only – each up about 1 percentage point from a year ago. For January through May, these ratios were 13 percent and 10 percent, respectively, steady with last year’s pace. Export value per head of fed slaughter was $264.98 in May and $249.67 for January through May – down 9 percent and 14 percent, respectively, from a year ago. 1. The bill exempts all animal feed from this program. Therefore, beef would not be labeled as a result of consuming GMO feed. 2. It further exempts products covered under the Federal Meat Inspection Act which are inspected by the Food Safety Inspection Service. This means that muscle cuts, ground product, etc. will not be covered by this law. 3. Mandatory disclosure only applies to products which are inspected by FDA under the Federal Food, Drug, and Cosmetic Act, unless the first ingredient in that product is beef. If the first ingredient is beef, then it will also be exempt from this law. There is an additional provision that says if the first ingredient is broth or water and the second ingredient is beef, then it will also be exempt. If beef falls anywhere else on the ingredient list, it will be subject to this law. Chairman, Pat Roberts from Kansas, worked hard to make sure these provisions where included and NCBA is grateful to him for his work. This week in Denver during the NCBA Mid-Year meeting members of MCA leadership and other producers from across the U.S will attend a forum with representatives from the CME to discuss concerns with the futures markets. Cattlemen have expressed concerns with the high volume frequency trading over the past several months within the cattle markets. The effectiveness of cattle futures contracts as a viable risk management tool is being called into question by many producers. This meeting is a continuation of NCBA's working group with CME to address concerns of market volatility. 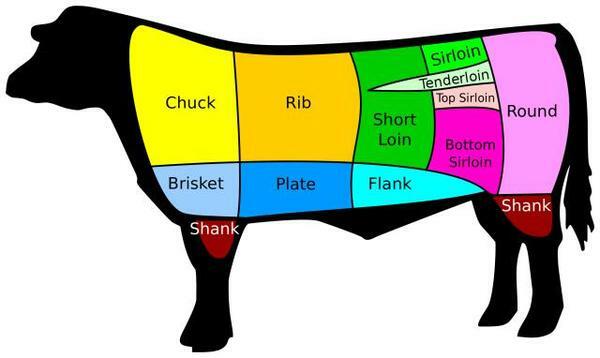 The checkoff funded Muscle Profiling research that has revealed a number of new beef cuts that also provide the great taste and tenderness thought to belong only to cuts from the rib and loin. Can you name them? And, which one is your favorite?? ?